When it comes to matches in Chittagong, the weather is always a concern. The drainage at the ground is so bad that Zimbabwe's coach Alan Butcher once suggested even football matches would be called off because of the soggy field. With rain forecast on two of the three days of the Test, it is likely that chunks of play will be lost. The way some of the Bangladesh and West Indies batsmen bat, though, three days could provide a result. Over the first two ODIs, Bangladesh were either too cautious or too reckless with the bat, and in the third the West Indies batsmen made the Chittagong pitch look like a pot-holed filled road and Bangladesh's spinners like Pradeep Mathew from the Chinaman. West Indies will have reinforcements in the form of the experienced Shivnarine Chanderpaul and Kirk Edwards, who scored a hundred on Test debut. Bangladesh's addition to the batting line-up, Raqibul Hasan, doesn't inspire as much confidence with his Test average of 19.14. Bangladesh have won only one Test at home, back in 2005, against New Zealand at the MA Aziz Stadium in Chittagong. This is as good a chance as they are going to get in the near future - their next two Test series are against Pakistan, who are looking a strong side in Abu Dhabi. Here, they have West Indies coming into the match after the embarrassing 61 all out in the last one-dayer; they're at a venue that has brought some big wins recently; and they have a new captain, who the team seems to have instantly taken to. For West Indies, this is a must-win Test. Despite the sometimes farcical events off the pitch, and the fact that their biggest stars are Twenty20 cricketers who don't play Twenty20 cricket for West Indies, their Test form has not been that poor. Over their home season, they won one and lost two of five Tests, a respectable performance considering three of those games were against then world No. 1 India. Anything less than a win here would be a major setback for Darren Sammy, who has quietly started turning around people's opinions on his surprise appointment as captain. They have the pace to unsettle Bangladesh and their young legspinner Devendra Bishoo is the reigning ICC Emerging Player of the Year. The question is whether their batsmen can figure out how to play half-decent spin bowling. 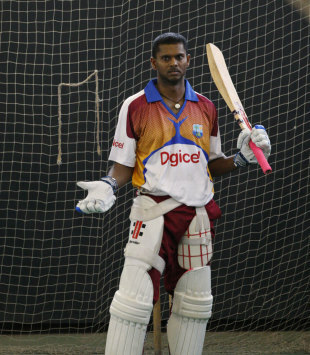 Shivnarine Chanderpaul has more Test runs than the entire Bangladesh squad combined. In an inexperienced team, whether or not Chanderpaul can grind it out in testing conditions will be a major determinant in West Indies' fortunes. Though he is only 25, Shahriar Nafees seems like he has been around for ages. It was in 2006 that he created waves with a century against the might of Australia. He never quite lived up to that early promise, but now, with Mohammad Ashraful dropped, Nafees has a chance to be the anchor of the team's batting. All the talk about Bangladesh's squad has been about Ashraful's exclusion and his reaction. Without Ashraful, Raqibul can be expected to play in the middle order. Nasir Hossain and Elias Sunny are expected to debut with Abdur Razzak dropped. Shahadat Hossain has the experience of 29 Tests and should fill in for the injured Shafiul Islam as the second seamer alongside Rubel Hossain. Bangladesh (probable): 1 Tamim Iqbal, 2 Imrul Kayes, 3 Shahriar Nafees, 4 Raqibul Hasan, 5 Shakib Al Hasan, 6 Mushfiqur Rahim, 7 Naeem Islam, 8 Nasir Hossain, 9 Elias Sunny, 10 Rubel Hossain, 11 Shahadat Hossain. Lendl Simmons replaced the injured Adrian Barath in the Test squad and, after a good one-day series, should make the XI. The other opener's position is between the 18-year-old Kraigg Brathwaite and 21-year-old Kieran Powell, each of whom have played just a single Test. Carlton Baugh should keep the wicketkeeper's spot in the Test side after impressing behind the stumps against India. West Indies opted for Fidel Edwards to share the new ball with Ravi Rampaul in the series against India, but Kemar Roach is also an option. West Indies (probable): 1 Lendl Simmons, 2 Kieran Powell/Kraigg Brathwaite, 3 Kirk Edwards, 4 Darren Bravo 5 Marlon Samuels, 6 Shivnarine Chanderpaul, 7 Darren Sammy, 8 Carlton Baugh, 9 Ravi Rampaul, 10 Fidel Edwards, 11 Devendra Bishoo. The pitch during the one-day match in Chittagong was sluggish and turned. Even the slightest amount of rain leaves the outfield wet and slow, making the conditions difficult for run-scoring. Showers are expected on the first two days of the Test, but the weather is expected to improve from Sunday. Out of the eight Tests played at the Zahur Ahmed Chowdhury Stadium, four were won by the team batting first, and three by the side batting second. The team that lost the toss won five matches. Ravi Rampaul has taken a wicket within the first ten overs in seven of the last nine innings in which he has opened the bowling. "That was a game with the one-day team. Our minds have now changed quickly towards the Tests. Obviously, we finished the one-day series a bit of a low, but it's also a fact that we won a one-day series away from home for the first time since 2007." West Indies coach Ottis Gibson refuses to be deflated by West Indies' big loss in the third ODI. "We have got the potential. We need to score more runs at the top of the order. We go into the Test knowing this surface suits us and that gives us confidence." Bangladesh's coach Stuart Law thinks the conditions will have a role to play in the final outcome. Bangladesh's first Test at home in almost two years carries much significance with it: for Mushfiqur Rahim, making his debut as Test captain, for new coach Stuart Law - who follows two fellow Australians in this job - and for the selection panel, led by Akram Khan, which has taken some bold decisions in picking the squad. And, of course, for those new faces in the squad. Mushfiqur, Bangladesh's eighth Test captain and the second wicketkeeper to hold the job, has seen his stock rise rapidly in the past six months. His calmness belies his age (23); though excitable, he's always had a sense of being in control and the best compliment comes from his team-mates who say that when he's in charge he keeps things calm. The concern was that Mushfiqur's poor form behind the stumps and low scores in front of them would hamper his captaincy but - though it's early days - they haven't become an issue. He's developed the art of closing out tight games and he's done reasonably well with the bat, winning a Twenty20 and scoring a fine 69 that brought the team back from the dead in the second ODI; even his wicketkeeping has improved though he still does let the occasional one slip by. With the players, his biggest challenge was to keep Shakib involved and in the forefront, and he's managed that so far. Shakib will be needed in the Tests as well and given their relationship from school (BKSP), that is unlikely to be a problem. With the others, he's already earned their respect. The match is also a litmus test for Akram Khan, the former national captain who has found himself and his fellow selectors under increasing pressure. After the Test squad they named against Zimbabwe was questioned by then captain Shakib Al Hasan the latest controversy has risen from the complicated issue of Mohammad Ashraful, who has been dropped from the squad for the upcoming Tests. Though the drop was inevitable, it has raised questions over the selectors' consistency - especially since Ashraful had top-scored in Bangladesh's last Test. The problem stems from the selectors' preference for all-format selection as opposed to specialised Test selection. It is true that Ashraful hasn't done well in the recent ODIs but what has muddied the waters is the dropping of Alok Kapali and Robiul Islam as well, despite their decent form in the ODIs. Kapali looked like one of the very few batsmen who was getting used to the West Indies bowlers' shorter length and, while his brief innings in the second ODI was overshadowed by Mushfiqur's longer effort, Kapali fought in a crucial situation. Robiul too showed grit when the bowlers in Harare fell flat on the first day, his 12-over spell standing out as an example of the fight rarely seen among Bangladesh bowlers. Add Raqibul Hasan's inclusion after just two recent half-centuries and it is all making Akram's collective decisions look a bit skewed. Ashraful's outburst on Wednesday has not helped matters and only a strong showing on the field will allow this situation to die down. That performance could come from Shahriar Nafees, who looks set for an extended run in the No. 3 spot and will look to make the most of the opportunity. It's a golden chance too for Raqibul Hasan, who wasn't expecting a recall so soon. He has been okay in Test cricket, a different batsman to Tamim Iqbal, Imrul Kayes and Nafees as he likes to stay in. Nasir Hossain is set to debut in Tests after an impressive start to international cricket, his batting offering stability to the middle-lower order. Naeem Islam completes the long batting-line up, making the bowling line-up go through a major reshuffle too. Left-arm spinner Elias Sunny could also make his debut given Law's public endorsement, while Shahadat Hossain will take up Shafiul's place alongside the improving Rubel Hossain. Sunny, a left-arm spinner who bats quite well, has topped the averages in the Dhaka Premier League and has a good first-class record over the past four-odd seasons. His strength is his control - helpful against a side that looks vulnerable against a tight line on a turning track - and he can bowl long spells. The worrying factor for the captain and coach, who will decide on the final XI, is the bench strength in Chittagong. Nazmul Hossain played his only Test seven years ago against India, while Suhrawadi Shuvo's last first-class match was in May 2010. Shuvogoto Hom too is an unlikely choice, so selecting the XI could be quite an easy job - and probably less controversial than picking the squad. Hope Nasir can chop the top of his offstump off early. But to be honest, ZACS pitch is his forte....it would be rather difficlut to get Chander out. We won a test against NZ? At home? ^^He meant to say Zimbabwe. Come out all guns blazing. I hope we do well but our fragile batting order makes me very nervous. It seems like we will be relying on tamim to get a good start otherwise we could lose a few wickets in quick succession. Hopefully the pitch negates the bounce which is the main deficiency of most of our batters. not so hopeful about it. what we lack is consistency, batting well in one innings out of two or bowling well once out of two is just no't enough to win a test match. If Riyad is sick, he's sick, and theres no point playing him. Lets pray that this test does not get washed out. Both the team have equal chances to win this match, i will rather put Bangladesh ahead to WI. The article says New Zealand thats why. Isam bhai nailed it. I am having a bad feeling about this selection team. They really get carried away by the "recent" form factor and fails to have long term vision. No 3 and 4 becomes a walking wicket with this lineup. We can raise the issue of Selector's selection process but it cant hide the fact that those dropped players got what they deserved. Both Ash and Razzaq are not performing well for ages and regarding kapali, he seriously lacked confidence and looked unfit to play WI pace bowling. So, keeping them in the team will be nothing but a suicide mission. I don't like scrupulous reporters who seem to be unhappy about everything. When Ash is in the team, they are not happy. When selectors drop him, even then they are not happy. I really liked Coach Law's response in this regard. সর্বশেষ জিম্বাবুয়ে টেস্টে দলের পক্ষে সবচেয়ে বেশি রান করেও এই সিরিজে বাদ পড়লেন মোহাম্মদ আশরাফুল। এটাকে কি তাঁর জন্য দুর্ভাগ্যজনক বলবেন? Agree Naimul Bhai but you do agree that Ashraful should have been dropped way before and the way he has been handled raises a few questions in mind. Even I myself don't have faith that he would indeed have done something different in test had he been included but It can't hide the fact that he top scored last Zim test. If anything, he deserved to play the test and not the ODIs. I like to think of it as a blessing in disguise but still it somehow shows the selection process screw ups ? But like many of us here, I would stop budging about it because THIS indeed is what we wanted. We got it, and we'll take it no matter how it comes. Ashrafuls constant failures doesn't help him and not even when he's partially right as such the case.